The Pima County Board of Supervisors has delayed a vote to implement a ban on hiring smokers. For about three years, Katherine Castillo has worked as a hotel housekeeper earning Arizona’s minimum wage of $7.80 an hour. Agents with the Arizona Attorney General’s Office had a sticky problem when they walked out of lobbyist Gary Husk’s office on Jan. 27, 2012, with documents and computer data seized as evidence. Arizona officials are studying whether current and former members of the state Board of Executive Clemency are owed potentially significant amounts of overtime pay. Some members of Arizona’s congressional delegation hoped to show solidarity with furloughed federal employees by cutting or suspending their pay during the government shutdown. Some of the firefighters killed in the Yarnell Hill Fire were only seasonal Prescott city employees so their families don't qualify for full survivors' benefits, but a legislative leader wants to change that. 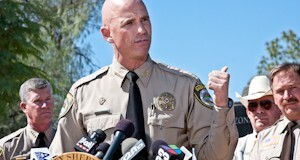 Pinal County supervisors are delaying their vote until next month on the controversial reclassification plan of Sheriff Paul Babeu. A committee that studied funding issues with Arizona's pension system for public employees is recommending that current and former workers be allowed to move into a 401(k)-style plan as an optional alternative to fixed-benefit pensions.